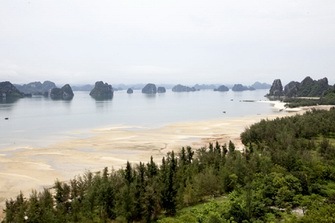 Speaking of Quang Ninh tourism people think of HaLong bay and Bai Chay beach, Van Don or Quan Lan island.... However, Quang Ninh also has an island that few people know, the Ngoc Vung Island. In the American war, Ngoc Vung was an outpost island protecting eastern skies of the Vietnam country, local people made brave victories and were awarded the title "Hero island". It was also at the white sand beaches to the east of the island, in 1937 the first stone tools belonging to the ancient Halong culture period, the post-Neolithic period were discovered, opening for excavations and archaeological research, study the secrets of Halong in ancient time. From the tip of the Dragon's Eye one has a panorama view of the Co To islands. sunlight. Here visitors are swimming, sightseeing...Seafood is cheap and plenty and is supplied by the local fishermen. Ngoc Vung island is full of geographical factors such as rivers, beaches, bay, harbors and plain ... On the island there is plenty of freshwater and people grow rice. At this time the island only has about 1,000 residents. Landscape and peaceful life here that many visitors see it like a beautiful village in the middle of the ocean. From the center, visitors can tour the historic sites such as Uncle Ho history site on the island, take a comprehensive view from the hill above, flag pole... Most interesting perhaps, is to do sightseeing by tuk tuk or bike between tall shady trees, casuarina forest around the coastal beaches. The Truong Chinh beach, Stronghold rock at the end of the beach. The most attractive place on the island is the 3km long sandy beach, unspoiled., uncrowded by mass tourism. Water in the sea is clean and blue, gentle, smooth sand beaches. In a peaceful space tourists can let their feelings floating around or listening to the whispering waves. This is the ideal destination on hot summer days. Going to Ngoc Vung visitors can have homestay in the village, also an interesting option. People on the island are honest and friendly. If you want to tour the island by bicycle do not hesitate to ask to borrow a bicycle or motorcycle, they are willing to lend you. It is really interesting to visit the tranquil seaside fishing villages, around the paths and the little houses, joing sea fishing trips, pulling nets enjoy fresh delicious seafood also make the island more fascinating for visitors.